Woodbury is a new community of 400 signature homes, just six miles from downtown Apex nestled between US-1 and Highway 64. The community brings a southern farmhouse theme into the homes and amenity plans. The life you want to live is waiting for you at Woodbury. Explore this community and see for yourself. The Cottage Series ranch home designs include well integrated kitchens, guest suites and options for second floor lofts, flex space and sunrooms. The Glen Series offers extended sitting room in the owner’s suite and a first floor Pulte Planning Center desk area built in to help with organization. The Reserve Series features formal dining rooms, versatile upstairs lofts and larger home designs built for families or those requiring additional bedrooms. 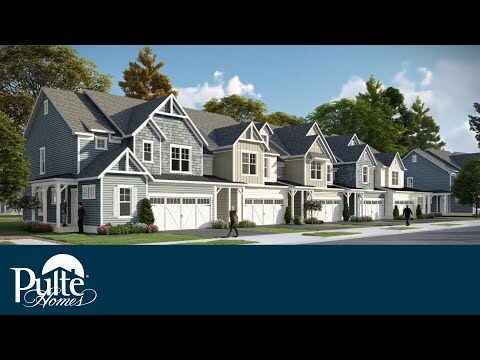 The Townes Series are 2 story townhomes with spacious owner’s suites, 2-3 bedrooms and include open floorplans great for entertaining. The Abbeyville new home design has an open layout, an integrated kitchen, café, and gathering room with an adjacent flex room for an office. The Brookfield boasts an ideal floor plan for entertaining with a spacious kitchen, connected gathering room and café area. The Castle Rock’s many gathering areas – plus a gourmet kitchen and formal dining room – inspire you to entertain. The Summerwood's open concept modern design features a large kitchen island overlooking the gathering room, making entertaining a breeze. The Senoia is an open and airy single-story floor plan with lots of natural light, plenty of storage and the option for a den. The Eastway is a light-flooded single family home with a well-equipped kitchen, flexible gathering area and an optional loft. The Mercer includes a Pulte Planning Center®, upstairs loft, and a large Owner's Suite with naturally lit sitting area.